KCCA FC 0 – 0 Maroons FC. 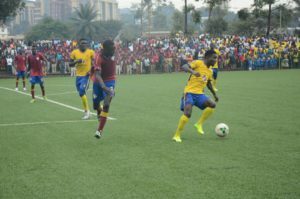 KCCA FC played out a goaless draw with Maroons at the StarTimes Stadium in the league opener. The Kasasiro boys who were tiped to put Maroons to the sword, clearly had a bad day at office failing to create any clear cut chances. On the other hand, Maroons where the ones creating the better chance, with man of the match Charles Lukwago the one to thank for the stalement as he made several excellent saves to deny the new comers. The higlight of the game was when Lukwago dived high to his left to tip over Godwin Kitagenda’s free kick in the first half. Mike Mutebi, KCCA FC head coach, said it was a bad day, adding that they were lucky to have gotten something from the game. “The so called big players like Muzamir Mutyaba did not turn up and we were playing alot of horizontal passes which were not taking us foward,” he said. Asaph Mwebaze, Maroons head coach, said: “We are gutted because we created the better chances but could not score. I don’t blame the boys because they where playing the defending champions so they may have been a little fazed by the occassion. KCCA travel to Bombo to play Moses Basena’s UPDF side while Maroons are at home to Onduparaka in Luzira.